Hank Azaria reveals that his part in ‘America’s Sweethearts’ originally went to Robert Downey Jr., and discusses the kind of roles he gets offered – and the ones he doesn’t – three decades into his career. Hank Azaria: You know I only did that because Robert Downey couldn’t. Hank Azaria: That was his role to begin with, and then I think he was having some kind of difficult back then, so it fell to me. So all different ways. Larry King: So, they call you for what? 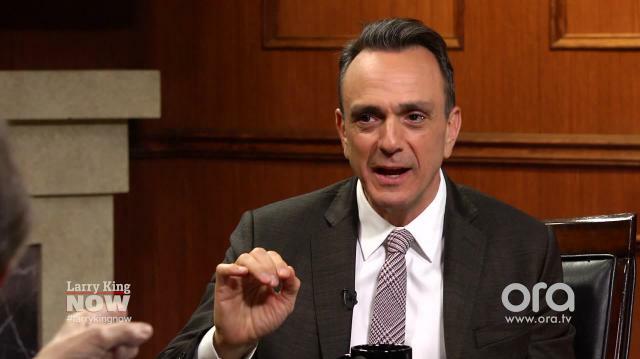 When Hank Azaria is called to read a script, what does he expect? Hank Azaria: You know, look, ‘Brockmire’ developed on my own for years and years and years. ‘Ray Donovan’ they called up—I’m just as surprised by what they call and offer me as what I don’t get—I can’t figure it out. I’m fortunate at this point after 30 years, I’m known as a character actor who can do comedy or drama, so that’s my reputation now. So I never know what’s coming up. Larry King: Have you ever had your name above the title? Larry King: That was a good movie. Hank Azaria: Wasn’t bad, but it made—I literally think this mug [holds up Larry King mug] is worth more than that movie made. So that was unfortunate for me from a commercial standpoint. And then in television I’ve developed. I don’t know if my name was above the title, but that’s never gone well until this moment.